Caribbean Journeys is an ethnographic analysis of the cultural meaning of migration and home in three families of West Indian background that are now dispersed throughout the Caribbean, North America, and Great Britain. 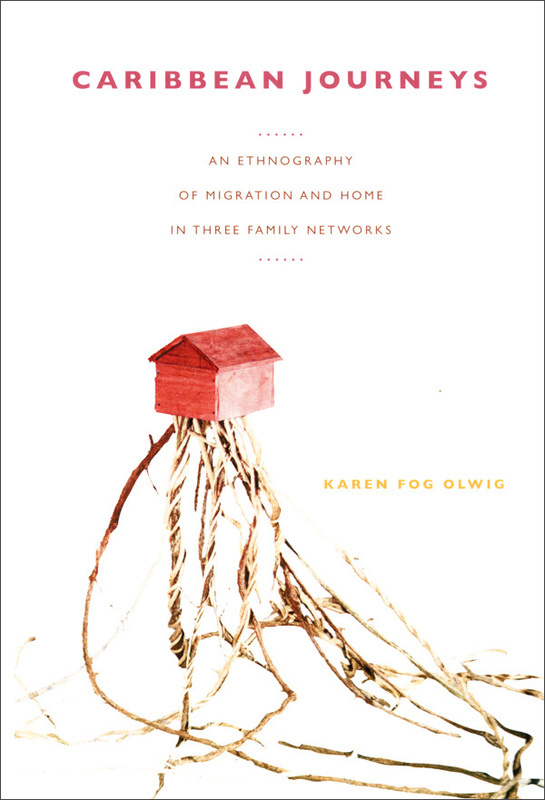 Moving migration studies beyond its current focus on sending and receiving societies, Karen Fog Olwig makes migratory family networks the locus of her analysis. For the people whose lives she traces, being “Caribbean” is not necessarily rooted in ongoing visits to their countries of origin, or in ethnic communities in the receiving countries, but rather in family narratives and the maintenance of family networks across vast geographical expanses. The migratory journeys of the families in this study began more than sixty years ago, when individuals in the three families left home in a British colonial town in Jamaica, a French Creole rural community in Dominica, and an African-Caribbean village of small farmers on Nevis. Olwig follows the three family networks forward in time, interviewing family members living under highly varied social and economic circumstances in locations ranging from California to Barbados, Nova Scotia to Florida, and New Jersey to England. Through her conversations with several generations of these far-flung families, she gives insight into each family’s educational, occupational, and socioeconomic trajectories. Olwig contends that terms such as “Caribbean diaspora” wrongly assume a culturally homogeneous homeland. As she demonstrates in Caribbean Journeys, anthropologists who want a nuanced understanding of how migrants and their descendants perceive their origins and identities must focus on interpersonal relations and intimate spheres as well as on collectivities and public expressions of belonging. Karen Fog Olwig is Professor of Anthropology at the University of Copenhagen. She is the author of Global Culture, Island Identity: Continuity and Change in the Afro-Caribbean Community of Nevis and Cultural Adaptation and Resistance on St. John: Three Centuries of Afro-Caribbean Life and a coeditor of Caribbean Narratives of Belonging: Fields of Relations, Sites of Identity.